This study aims to evaluate the frequency of fatigue in Moroccan patients with ankylosing spondylitis (AS), and its relationships with disease-specific variables, psychological status, and sleep disturbance. A cross-sectional study included patients fulfilled the modified New York classification criteria for ankylosing spondylitis. To assess fatigue, the first item of Bath ankylosing spondylitis disease activity index (BASDAI) and the multidimensional assessment of fatigue (MAF) was used. 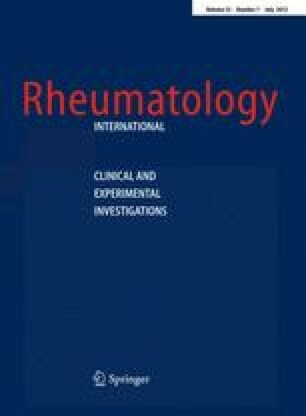 The evaluation included the activity of the disease (BASDAI), global well-being (Bath ankylosing spondylitis global index), functional status (Bath ankylosing spondylitis functional index), metrologic measurements (Bath ankylosing spondylitis metrological index), and visual analog scale of axial or joint pain. The erythrocyte sedimentation rate and C-reactive protein were measured. To assess psychological status, the hospital anxiety and depression scale (HADS) was used. Sleep disturbance was assessed by the fourth item of Hamilton anxiety scale. One hundred and ten patients were included, of average age 38.0 years ± 12.6. In our data, 66.4% experienced severe fatigue (BASDAI fatigue ≥5). The mean total score of MAF was 26 ± 12.77. The disease-specific variables contributed significantly with both BASDAI fatigue and MAF as dependent variables, accounting for 71.3 and 65.6% of the variance, respectively. The contribution of the depression, anxiety, and sleep disturbance were 24.9, 18.4 and 15.4%, respectively. This study state the importance of fatigue in AS patients. Even though disease activity was the most powerful predictor of fatigue, the effects of psychogenic factors and sleep disturbance, should be taken into consideration in the management of AS. This work was supported by grants from the University Mohammed V, Souissi, Rabat-Morocco.